Whether you are a complete beginner or advanced player you are guaranteed to make fast progress and be challenged to reach your full potential. Each lesson is tailored to the individual to ensure the most effective results, all in a fun and relaxed environment. 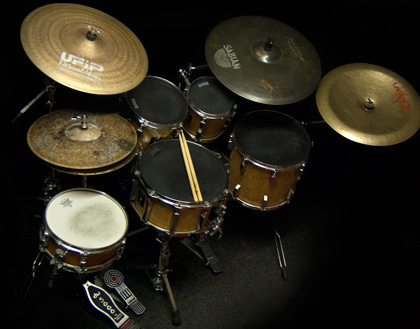 The studio is equipped with two top of the range Sonor acoustic drum kits, P.A. backing tracks and sequencers running off a Mac and Logic pro, basically everything we need to prepare you to be the best drummer and musician you can be. For younger students I have developed my own system, which ensures that they are playing and understanding within the first lesson. Preparation for grades and exams (including grades 1-8, GCSE, A-Level, Degree) – 100% success rate! It should be noted that I can prepare you for any qualification you chose but this will be an addition to the key material we will cover, unfortunately too many teachers follow and depend heavily on grade syllabuses as a matter of course for their teaching material. I do not. In-depth analysis of all styles including rock, jazz, world music, metal, funk, fusion, drum and bass/modern electronic genres. Drum lessons covering Wimbledon, Kingston Upon Thames, Clapham, Wandsworth, Merton, Putney, Fulham, Surbiton, New Malden, Sutton, Morden, Roehampton, Barnes, Richmond, Tooting, Balham, Tolworth, Chessington, Mitcham and Battersea, South London and Surrey.